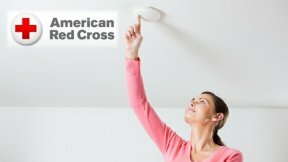 The Chicago & Northern Illinois Red Cross is looking for volunteers to help install 2,000 free smoke alarms as part of a national target of 100,000 in just three weeks. The American Red Cross has launched the “Sound the Alarm. Save a Life” campaign to install 100,000 free smoke alarms in cities across the country. Two thousand alarms will be installed in the Chicagoland area by volunteers over the course of three weeks. It is part of a national goal to help save lives and lessen the number of tragedies attributed to home fires. The Chicago Red Cross is partnering with the Chicago Fire Department and the Office of Emergency Management and Communications (OEMC) to install these lifesaving smoke alarms in high-risk neighborhoods. The Red Cross is issuing a call for volunteers to come onboard and help with the upcoming installation events. Visit soundthealarm.org/chicago to apply to be a volunteer. The Sound the Alarm events are part of a nationwide series of home fire safety and smoke alarm installation events to be held in September and October, culminating in the Red Cross’ installation of the one-millionth free smoke alarm since its Home Fire Campaign launched in 2014.